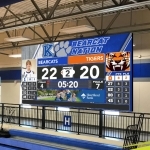 Kearney High will be installing a new all-digital scoreboard with a video screen in the main gym. The new scoreboards will be connected to a digital app that will track team scores, stats, rosters, and schedules. The scoreboards will be installed this summer and should be ready for the fall semester. The current scoreboards will replace and upgrade the much older scoreboards currently at Sunrise and Horizon Middle Schools.